"Amina's anxieties are entirely relatable, but it's her sweet-hearted nature that makes her such a winning protagonist." -Entertainment Weekly A Pakistani-American Muslim girl struggles to stay true to her family's vibrant culture while simultaneously blending in at school after tragedy strikes her community in this sweet and moving middle grade novel from the award-winning author of It's Ramadan, Curious George and Golden Domes and Silver Lanterns. Amina has never been comfortable in the spotlight. She is happy just hanging out with her best friend, Soojin. Except now that she's in middle school everything feels different. Soojin is suddenly hanging out with Emily, one of the "cool" girls in the class, and even talking about changing her name to something more "American." Does Amina need to start changing too? Or hiding who she is to fit in? While Amina grapples with these questions, she is devastated when her local mosque is vandalized. 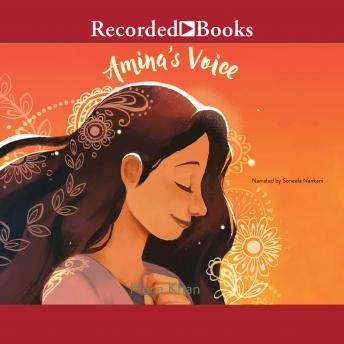 Amina's Voice brings to life the joys and challenges of a young Pakistani American and highlights the many ways in which one girl's voice can help bring a diverse community together to love and support each other. Author bio: Hena Khan is a Pakistani-American who was born and raised in Maryland. She enjoys writing about her culture as well as all sorts of other subjects, from spies to space travel. She is the author of several books including It's Ramadan, Curious George; Golden Domes and Silver Lanterns; The Night of the Moon; and Amina's Voice. Hena lives in Rockville, Maryland, with her husband and two sons. You can learn more about Hena by visiting her website at HenaKhan.com.